Fresh water was hard to find, but where it emerged on Easter Island in the South Pacific was an important factor for where Polynesians built their monuments, according to new research led by University of Oregon doctoral student Robert DiNapoli. 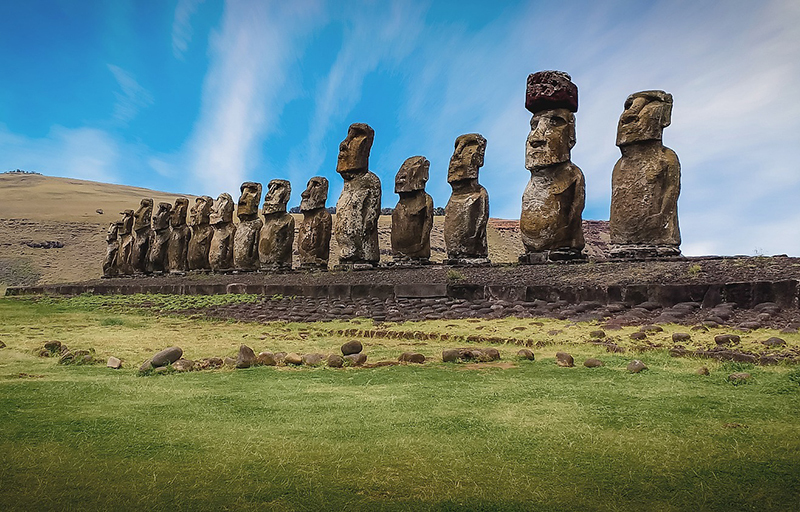 The island, also known as Rapa Nui and a territory of Chile, is famous for its elaborate ritual architecture, particularly numerous statues and the massive platforms that supported them. Researchers have wondered why people who colonized the island, probably in the 13th century, exerted the time and energy to build hundreds of the monuments where they did. His new study, done with anthropologists at six other institutions, used mathematically driven spatial modeling to connect the various relationships and discover that the source of fresh water was likely an important factor for where to place the stone platforms known as ahus and the whole-body statues called moai. The research was detailed in the paper published Jan. 10 in the journal PLOS One. In their modeling, the research team considered each site with subsistence resources, namely, rock mulch agricultural gardens, marine resources and fresh water sources — the three most critical resources on Rapa Nui. A team of researchers, including Binghamton University anthropologist Carl Lipo, used quantitative spatial modeling to explore the potential relationships between ahu construction locations. Their results suggest that ahu locations are explained by their proximity to the island's limited freshwater sources. That connection isn’t obvious for an observer walking on the island, the researchers noted. Even at locations in the island’s interior, freshwater sources were found near the stone structures. So far, the research team has collected data on freshwater sources for the eastern portion of the island. Under a new grant from the National Science Foundation, DiNapoli will return to the island in May to complete the survey of the rest of the island. DiNapoli became fascinated with archaeology, especially that on Easter Island and others nearby, as a child, he said. In 2011, his interest in Rapa Nui led him to the University of Hawaii at Manoa to pursue a master’s degree with Terry Hunt. After Hunt moved to the UO as dean of the Clark Honors College, DiNapoli eventually followed him to continue studying the island with a team led by Hunt and Lipo. Hunt has since moved on to the University of Arizona. DiNapoli is completing his doctoral work under the mentorship of the UO's Scott Fitzpatrick, an expert on the early Polynesian migration. Co-authors on the paper with DiNapoli were Lipo; Hunt; Tanya Brosnan and Matthew Becker, both of California State University, Long Beach; Alex E. Morrison of the International Archaeological Research Institute in Hawaii and the University of Auckland; and Sean Hixon, a former UO undergraduate student now pursuing a doctorate at Pennsylvania State University.